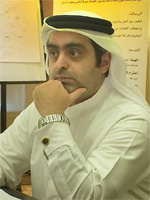 Dr. Ali Salem, physician and former UAE military officer. Worked in Dubai Health Authority – Trauma Center. Masters in Disaster Management and Medical Crisis. Worked in the Ministry of Labour as the first Director of Occupational Health and Safety, and currently the Director of Clients Affairs. And a member of the International Institute of Risk and Safety Management.